Who doesn't like to eat and socialize? In Second Life you can virtually do both. 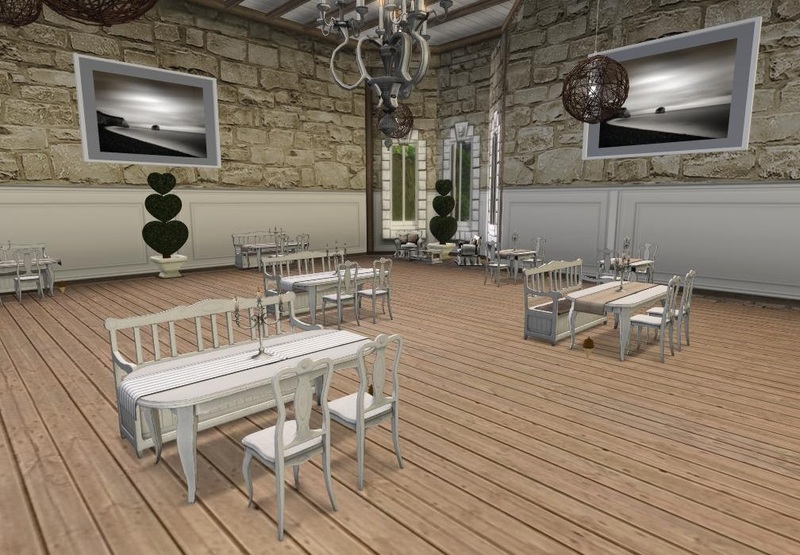 Going to a restaurant in SL can be a fun way to socialize away from loud music and a crowd. It is a perfect setting for a first date or place to gather with a group of friends outside of a club scene. I was able to find some great places and even met with some of the restauraunt owners. Harborside Bistro Restaurant is located on the water and is full service eatery. It offers a variety of foods for breakfast and dinner including, fruit, breads, lobster and even filet mignon. You can choose to sit upstairs or downstairs. There is even a nice patio area for sitting and chatting. It’s free to eat here but of course tips are appreciated. Harborside Bistro is a nice and quaint place if you're looking for some time alone with a someone or just needs a place to yourself to come and enjoy. I was greeted by staff when I came to After Taste. Later I learned that these were the owners of the restaurant Ron & Savannah Kira. It was 100L per person and we’ll worth the price. I was escorted to a wonderful table by the water and they explained to me how everything works. After looking through the menu I chose my drink & meal while I chatted a bit with the owners. They told me that the reason they wanted to open a restaurant here in Second Life was because there weren’t many intimate spots for couples to enjoy a evening out. I must say this restaurant is very nice. They also do cater to different events and parties. I was surprised to learn that all guests receive a frame with their photo to take home with them. What a great touch! The owner of The Corner Restaurant was there to greet me and show me to my table by the piano. This restaurant has a country feel to it. I was given a menu of food choices and prices. They were very reasonable. This restaurant is run by owner,Bella Dela Cruz and her daughter and is family RP friendly. Bella and I sat and talked while I ate and she told me that her family decided to open a restaurant so that large families can come and enjoy themselves. There is even a park outside for kids to enjoy. They read a book every Sunday for the children and they are given a meal and a keepsake. This is a unique touch to a virtual restaurant experience. If you're looking to take your family out for a day then this is the place that I would recommend. Ja”Ames is a very classy restaurant. The owner, Mrs Trenchy is the twin sister of the Corner restaurant owner. She and I talked while we sat in the elegant dining room. She said that she wanted to bring the closeness of family together while rping a nice meal together. She also said that in rl she loves to cook so having a restaurant here in Second Life was another way for her to enjoy her love of food. Ja ‘Ames is new but from the looks of it I think it will be a great success, They also offer catering to all types of parties. Muirsheen Durkin bar & restaurant also known as Brunell Hall Restaurant its home to Isambard Kingdom hotel. It is a full service restaurant. 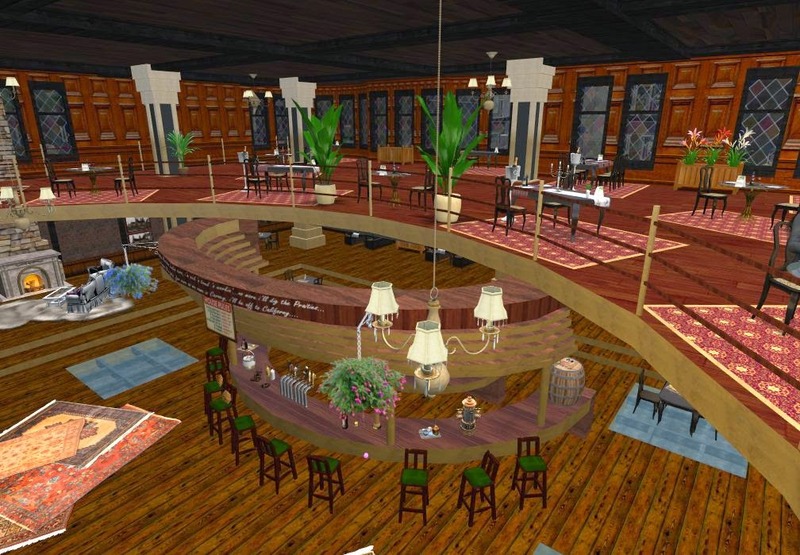 It is one of the oldest places here in Second Life dedicated to the bygone era. There is a full service bar and places to sit by the fireplace to talk. They also have a smoking room for after dinner and game Lounges where you can dance with your partner or friends. You can either enjoy the atmosphere from either downstairs or upstairs. This is a great place for a romantic dinner for two. Even thought avatars don’t need food for survival, the role play can be fun and entertaining. 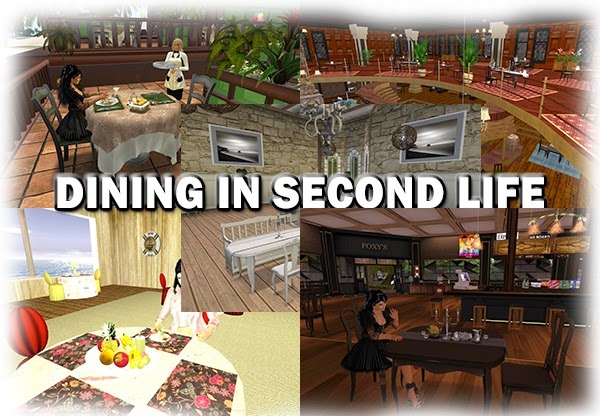 Second Life Restaurants are not only for eating but also for getting together with a special someone, friends, family or maybe even meeting someone new. Finding a place you feel relaxed can be a challenge when club scenes and parks are things you have visited enough. Get out there, explore and visit the places that I have mentioned. I guaranteed that you are going to have a wonderful time.